Boasting impressive 3D performance and a powerful processor, the Acer Aspire 5739G-654G32Mn provides the a high level of power and could be just what you're looking for if you're in the market for an entry-level multimedia machine. The 2.1GHz Intel Core 2 Duo processor has a reasonably fast clock speed and, when combined with its 4096MB of DDR3 memory, provided very strong performance in our benchmarking tests. Everyday use is fast and we had no issue running various multimedia applications concurrently. 3D performance also greatly impresses. While you will struggle to play the most demanding games, slightly older titles run without issue and you'll certainly have no problems editing digital photos and videos. Adding to its multimedia credentials, a row of touch-activated hotkeys run along the top of the keyboard, providing quick control of your multimedia applications. This is a useful feature often only found in more expensive laptops. The 15.6-inch screen is the third largest here and is well suited to watching films, as it features a widescreen 16:9 aspect ratio. A glossy Super-TFT screen coating is in place, but it isn't too distracting. The chassis employs Acer's NeoWeave pattern design, which is essentially a mottled finish. It is very durable and provides ample protection for the laptop. The keyboard features a design unique to Acer, whereby the keys are raised high above the chassis. It works well enough, but leaves space for dust and dirt to gather in the space beneath the keys, which may eventually hinder the action. A dedicated numeric keypad makes inputting data quick and easy. The touchpad is built from the same piece of plastic as the chassis and features gesture-control functionality, allowing you to use your fingers to zoom in and out of documents, scroll down web-pages and spin photos. It is a little erratic, but ultimately works well. Connectivity is suitably high-end, with 802.11a/g/n Wi-Fi and Gigabit Ethernet providing the fastest connection to networks – be it wireless or fixed – currently available. Four USB ports let you connect peripherals, while an eSATA port lets you transfer data to external hard drives at very high speeds. Connecting to both analogue and digital external monitors is also easy, with both VGA and HDMI ports included. Finally, a fingerprint reader provides security for your data. 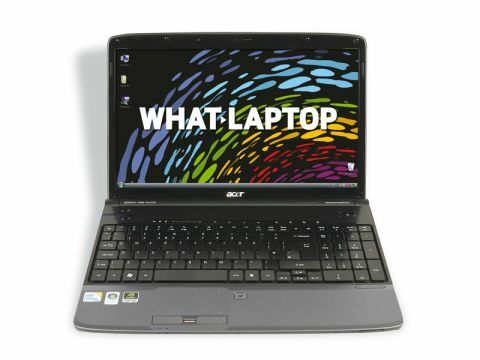 The Acer Aspire 5739G-654G32Mn manages to combine portability with power and value for money. If you're after multimedia performance, this is a serious contender.